BRYSON, GEORGE, businessman, politician, office holder, and jp; b. 16 Dec. 1813 in Paisley, Scotland, son of James Bryson, a weaver, and Jane Cochrane; m. 4 March 1845 Robina Cobb in Bytown (Ottawa), and they had seven children, of whom at least four survived infancy; d. 13 Jan. 1900 in Fort-Coulonge, Que. George Bryson accompanied his parents to Ramsay Township, Upper Canada, in 1821; he received his education in the local school. In 1835 he and his brother-in-law Hiram Colton left for the Pontiac region of Lower Canada and set up in the timber trade at the former fur-trading post of Fort-Coulonge on the upper Ottawa River. Bryson initially concentrated on square timber for the British market and, despite the fickleness of the trade, prospered. In the 1850s he began moving into sawn lumber after the American market for that product opened up. Slowly Bryson acquired cutting rights on both government timber limits and privately held lands around Fort-Coulonge. There in the late 1850s he constructed a large house and office complex to serve as his headquarters. Bryson’s increasing stature in the rapidly growing town of Fort-Coulonge (it counted 75 inhabitants in 1857–58 and 500 in 1864–65) as well as in the region was reflected in the public offices he held. 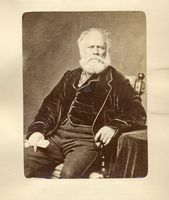 From 1855 to 1857 and from 1862 to 1867 he was mayor of the united townships of Mansfield and Pontefract (which included Fort-Coulonge until 1888). He was also postmaster at Fort-Coulonge by 1857–58, warden of Pontiac County in 1862 and 1863, and justice of the peace for the Ottawa District before 1863 and after 1867. During a provincial by-election for Pontiac County in 1857 he had won a seat in the Legislative Assembly as a Conservative, but the legislature had been dissolved before he could take it, and he was defeated in the subsequent general election. His growing influence in the region was recognized shortly after confederation when, on 2 Nov. 1867, Premier Pierre-Joseph-Olivier Chauveau* appointed him to the Legislative Council of the province of Quebec for Inkerman Division. By the early 1860s Bryson had emerged as a doyen of the lumbering fraternity on the upper Ottawa and a business force in the valley. In 1870 he and other leading lumbermen established the Upper Ottawa Improvement Company to drive all the logs on the river, construct improvements, maintain booms and slides, and transport supplies and passengers. Shrewd, steady, cautious, and successful, he was considered a man of excellent character, and he enjoyed a strong credit rating. He was a middle man in almost every aspect of the timber trade, and he either milled the logs he cut or sold them whole to sawmill operators downriver. By the 1870s he may have owned about 5,000 acres of land in the valley, some of which he had been using to grow agricultural products needed in his own and other shanties; he supplemented his harvests with purchases from local farmers. His brother Thomas, who had joined him at Fort-Coulonge, supported his endeavours by opening a general store. During the 1870s and 1880s Bryson expanded considerably the scope of his business activity. He was an initial promoter of the Bank of Ottawa, established in 1874 to underwrite business developments in the Ottawa valley; after 1881 it extended its activities into western Canada. In the 1870s he promoted a northern extension of Sir Hugh Allan*’s Montreal Northern Colonization Railway, which linked Montreal and Ottawa, and then of its successor, the Quebec, Montreal, Ottawa and Occidental Railway. Incorporated in 1880 as the Pontiac Pacific Junction Railway, this extension was built on the Quebec side of the Ottawa River from Hull to Île des Allumettes and then across the river to Pembroke, Ont. Its backers gambled that it would become a link in the projected transcontinental railway, but they were outmanœuvred by more influential rivals on the Ontario side, which was better developed economically. Later the railway was promoted as a colonization line and transportation link for the timber trade. In politics Bryson had been consolidating family influence in the Pontiac region. The post of mayor of Mansfield and Pontefract was held by Bryson himself in 1877–78, by Thomas from 1878 to 1881, and by Bryson’s eldest son, John, from 1882, probably until the second son, George, took it over in 1891; George Jr held it again in 1894–95. Thomas won the seat for Pontiac in the provincial Legislative Assembly as a Conservative in 1881 but died before he could occupy it; John sat for Pontiac as a Conservative in the federal House of Commons from 1882 to 1891 and from 1892 to 1896; and George Jr replaced his father as the legislative councillor for Inkerman Division in 1887. Probably during the 1880s the family’s identification with the Conservative party began to erode; George Sr had become “a moderate Reformer” by 1887, and George Jr was a Liberal. 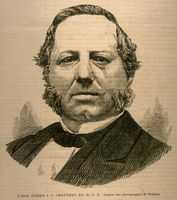 Bryson’s position as legislative councillor enabled him to serve as a conduit between the government and the lumber barons of the Ottawa valley, who from about 1880 began lobbying over several major concerns. As logging teams reached the northern limits of pine on the headwaters of the Ottawa, lumber interests were increasingly coming into competition for forest lands with the powerful colonization movement backed by the Roman Catholic clergy [see François-Xavier-Antoine Labelle]. Coincidentally, the government was studying a new licensing system that would increase provincial revenues at the expense of permit holders. A defender of the lumbermen’s position was the Quebec Limitholders’ Association, of which Bryson was a leading member and for which he was a spokesman with government. The lumbermen’s views were given a full airing at the American Forestry Congress held in Montreal in August 1882. It constituted the first major effort to promote forest conservation in Canada [see James Little*]. Appointed to a committee on the prevention of forest fires, Bryson presented its report, which recommended, among other things, the reservation for lumbering of certain forest lands unfit for settlement, a ban on brush burning by settlers in the summer and fall to be enforced by officers with magisterial powers, and the financing of a fire prevention system in part by a modest tax on timber operators. The recommendations subsequently formed the basis of legislation produced by several governments in Canada – including that passed by the government of Quebec in 1883 establishing the first forest reserve in the country – and served to win the lumberers’ support for forestry measures down to World War I. After his retirement from politics in 1887 Bryson maintained a keen interest in business, and particularly in the affairs of the Bank of Ottawa, of which he was a director by that year. He was also a member of the freemasons in Ottawa. His death in January 1900 ended the career of a true lumber baron of the Ottawa valley, a man who combined entrepreneurship with political power to form a local family empire. Baker Library, R. G. Dun & Co. credit ledger, Canada, 3: 148. NA, MG 26, A: 58153–54, 187969–71, 188546–47; RG 15, DII, 1, vol.298, file 62441; RG 68, General index, 1651–1841: 298; 1841–67: 247–48. Can., Statutes, 1880, c.55. Ont., Legislature, Sessional papers, 1882–83, no.3, app.C, app., “Report of delegation appointed to attend the American Forestry Congress held in Montreal, Province of Quebec.” Montreal Herald and Daily Commercial Gazette. Canada directory, 1857–58: 143; 1864–65: 184. Canadian directory of parl. (Johnson), 80. Canadian men and women of the time (Morgan; 1898). CPC, 1887: 98, 234. Cyclopædia of Canadian biog. (Rose and Charlesworth), 2: 470–71. J. Desjardins, Guide parl. Quebec directory, 1871: 96. RPQ. E. T. D. Chambers, “Forest resources,” Canada and its provinces; a history of the Canadian people and their institutions . . . , ed. Adam Shortt and A. G. Doughty (23v., Toronto, 1913–17), 16: 531–51. A. R. M. Lower, Great Britain’s woodyard: British America and the timber trade, 1763–1867 (Montreal and London, 1973). Pontiac & the Brysons . . . (Campbell’s Bay, Que., 1980). Mrs Owen Toller, “The Brysons came out of their own free choice,” Some of the stories I told you were true, ed. Joan Finnigan (Ottawa, 1981), 101–5. B. J. Young, Promoters and politicians. B. W. Hodgins et al., “The Ontario and Quebec experiments in forest reserves, 1883–1930,” Journal of Forest Hist. (Santa Cruz, Calif.), 26 (1982): 20–33. Robert Peter Gillis, “BRYSON, GEORGE,” in Dictionary of Canadian Biography, vol. 12, University of Toronto/Université Laval, 2003–, accessed April 24, 2019, http://www.biographi.ca/en/bio/bryson_george_12E.html.